I think there is a case to be made for the rules being slightly different on a PM to PM basis, than for other kinds of politcal meetings. Much like US Presidents, is there not a 'club' of ex-Prime Ministers which transcends the normal political divide? This might all sound rather elitist (and I'm sure, to an extent, it is), but on the most basic level our Prime Ministers do hold office by the will of The People, and as office bearers (or former office bearers) I sort of feel they are due a measure of courtesy. However, to THEN abuse that courtesy, for current political gain, does indeed seem uncouth. 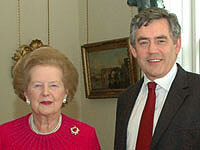 I can't help but think what the reaction would have been if Brown had had a photo-op with John Major. There is certainly a club of PMs and ex-PMs, since all of them (at least since the 1950s) have shared something no one else in Britain shares -- the power to destroy half of Europe with nuclear weapons. I am sure the enormity of this power, when fully understood by a new PM, creates a fellow-feeling for the others who have had this rare power. In the interests of the wise use of this power, it is probably a good idea for PMs and ex-PMs to get together occasionally. For comparison, JFK consulted with his conservative predecessor, Dwight Eisenhower, throughout his Presidency, and particularly often during the Cuban Missile Crisis. This was despite the contempt JFK heaped on Ike for his do-nothing administration and his foreign policy failures during the 1956 and 1960 presidential campaigns.